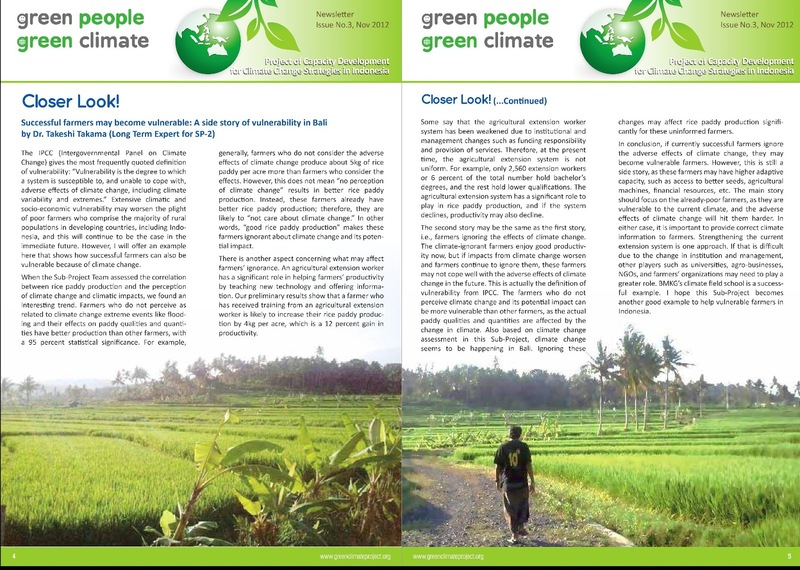 The IPCC (Intergovernmental Panel on Climate Change) gives the most frequently quoted definition of vulnerability: “Vulnerability is the degree to which a system is susceptible to, and unable to cope with, adverse effects of climate change, including climate variability and extremes.” Extensive climatic and socio-economic vulnerability may worsen the plight of poor farmers who comprise the majority of rural populations in developing countries, including Indonesia, and this will continue to be the case in the immediate future. However, I will offer an example here that shows how successful farmers can also be vulnerable because of climate change. When the Sub-Project Team assessed the correlation between rice paddy production and the perception of climate change and climatic impacts, we found an interesting trend. Farmers who do not perceive as related to climate change extreme events like flooding and their effects on paddy qualities and quantities have better production than other farmers, with a 95 percent statistical significance. For example, generally, farmers who do not consider the adverse effects of climate change produce about 5kg of rice paddy per acre more than farmers who consider the effects. However, this does not mean “no perception of climate change” results in better rice paddy production. Instead, these farmers already have better rice paddy production; therefore, they are likely to “not care about climate change.” In other words, “good rice paddy production” makes these farmers ignorant about climate change and its potential impact. There is another aspect concerning what may affect farmers’ ignorance. An agricultural extension worker has a significant role in helping farmers’ productivity by teaching new technology and offering information. Our preliminary results show that a farmer who has received training from an agricultural extension worker is likely to increase their rice paddy production by 4kg per acre, which is a 12 percent gain in productivity. Some say that the agricultural extension worker system has been weakened due to institutional and management changes such as funding responsibility and provision of services. At the present time, the agricultural extension system is not uniform. For example, only 2,560 extension workers or 6 percent of the total number hold bachelor’s degrees, and the rest hold lower qualifications. The agricultural extension system has a significant role to play in rice paddy production, and if the system declines, productivity may also decline. The second story may be related to the first story, i.e., farmers ignoring the effects of climate change. The climate-ignorant farmers enjoy good productivity now, but if impacts from climate change worsen and farmers continue to ignore them, these farmers may not cope well with the adverse effects of climate change in the future. This is actually the definition of vulnerability from IPCC. The farmers who do not perceive climate change and its potential impact can be more vulnerable than other farmers, as the actual paddy qualities and quantities are affected by the change in climate. 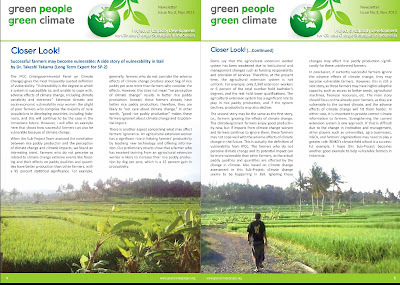 Also based on climate change assessment in this Sub-Project, climate change seems to be happening in Bali. Ignoring these changes may affect rice paddy production significantly for these uninformed farmers. In conclusion, if currently successful farmers ignore the adverse effects of climate change, they may become vulnerable farmers. However, this is still a side story, as these farmers have higher adaptive capacity, such as access to better seeds, agricultural machines, financial resources, etc. The main story should focus on the already-poor farmers, as they are vulnerable to the current climate, and the adverse effects of climate change will hit them harder. In either case, it is important to provide correct climate information to farmers. Strengthening the current extension system is one approach. If that is difficult due to the change in institution and management, other players such as universities, agro-businesses, NGOs, and farmers’ organizations may need to play a greater role. BMKG’s climate field school is a successful example. I hope this Sub-Project becomes another good example to help vulnerable farmers in Indonesia.